How do you run with glasses? A question to runners who have wear glasses for sight. How do you run with glasses? Or do you go with contacts ? I might be needing glasses in the future and thought that I should ask. Happy running. I wear glasses except for exercise. I wear contacts. However last year I had an ulcer on my eye and could not wear my contacts. I had some long runs where I felt like I was in my own world running without contacts or glasses. it’s not horrible to work out in glasses, but I can’t do it. Been wearing glasses since I was in 2nd grade. Not a biggie here. Though when its misty or really humid I have to take them off due to them getting foggy. I have contacts that I sometimes where especially for race days. I can’t wear contacts. My sunglasses are prescription and last weekend’s run without them confirmed my need for them. A bug flew right into my eye and I killed it. I just couldn’t get it out for a while. I wear my glasses for all runs, even the full that I did. I have transition lenses and they are a good fit and do not slide or bounce. I normally wear contacts, but find the sweat when I run irritates my eyes. When I run I wear prescription sun glasses. As a new runner I have debated this numerous times. Glasses are okay but you get one spec of sweat on them and your mind changes focus away from your run. I also wear contacts and have eperienced issues. Next trip to the eye doctor I plan on reviewing this and maybe a lens change is warranted. I hate running with my glasses on so I try and remember to put in my contacts when I run but that’s about all I wear them for. Contacts dry out in my eyes to fast for me to wear them all day. Would love to get prescription sunglasses but I can’t afford them plus I would think they would slide off my face just like my regular glasses. I wear my regular prescription glasses on every run. I have done anything from 5k to half, mud runs and even a trail race with them on without issues. The only time they bothered me was during very cold or humid races due to them fogging up. “DAILY” contacts” I tried every kind and daily disposable are perfect especially for sensitive eyes. Glasses are great for 1st thing in the morning; however, inconveinant for exerise or any other outdoor activity in my opinion. Glasses in the morning when I roll out of bed to run and need minimal distraction to actually get my but out of bed and get going. Contacts in the afternoon evening when its sunny. I have some serious light sensitivity and can’t do with out em in the sun. So I guess I’m always running with something on my face. You get used to it. I have terrible vision so I have to run with one or the other. If I’m doing an early morning run after rolling out of the bed, I always put my oldest pair of glasses on (doctor approved), they are transitional lenses and perfect for anytime of day but I’m hard on my glasses when I run which is why I use my older pair. If I’m running in a race, then I put my contacts in and run with sunglasses. I have prescription sunglasses but they are more for looking fabulous on the beach instead of running so they are big and bulky. 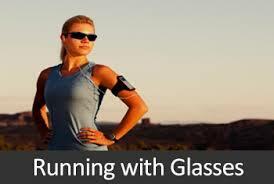 At my next eye appointment, I’m going to splurge for prescription sunglasses for running! I wear contacts with sunglasses when it’s sunny out. I can’t wear contacts too often or too long, cause I have sensitive eyes, but I will wear them for sunny races. I’ve been wearing glasses since I was 10, so I’m just used to it, I don’t even notice them anymore. You’ll get used to them eventually, you really will. I’ve worn glasses since I was 10 and typically wear them around the house or on “lazy days”. I almost always wear contacts when going out, though, but especially for runs. Whenever I do wear my glasses for a run, I’m quickly reminded of how I dislike them fogging up, bouncing, and sliding down my nose from sweat. I am legally blind if its raining i don’t wear them if its not I wear them until they are to sweaty then I cary them if its a race I toss them to some one I know spectating! I always run in prescription sunglasses and a hat (to help prevent any more skin cancer). Just wearing the glasses w/out the hat causes an annoying glare. I wear glasses because I found contacts to be too high maintenance. I got transitions lenses with Crizal coating, so that really helps. (Prepare to spend some $$ for this…) This way, I don’t need sunglasses and the water just beads off my glasses when it rains. (Although I always wear a brimmed cap if it rains or snows.) Take your time selecting lenses and don’t leave until you find lenses that won’t move or pinch. Finally — get a spare pair. Great question and I appreciate the answers! I can’t stand contacts and never considered transition lenses. This spring I went on a long run and started out with sunglasses. After a few miles, it got cloudy and I nearly ran in front of a car because I didn’t see it. I may need to splurge on a nice pair of transition running specs. I run with prescription sunglasses in the morning because my eyes are sensitive to the sun. I have to run with glasses. I am blind in one eye and so contacts are not an option for me. I have a pair of frames that I use only for running. They have nose pads and stay in place, even when I begin to sweat. I’ve been in glasses since 7, contacts since 13 and I prefer my contacts. I am almost blind without them. I get dizzy with my glasses so the only thing they are good for is watching TV. I have to wear sunglasses and a headband though. I bought a pair of champions from target, and they work great! I bought my sports glasses I run in from zenni optical. I have bought several pairs of glasses from them and have been super pleased and they are cheaper than buying them from a vision center, especially when our vision insurance won’t cover something. Your mileage may vary, but I’m extremely happy with mine. I just run! I have worn glasses for years, they fit well and don’t even think about it. This entry was posted in Question and Answers by Runners, Running Tips and tagged running with glasses.